This one of a kind choker has a base of luxurious vintage burgundy wine velvet ribbon. 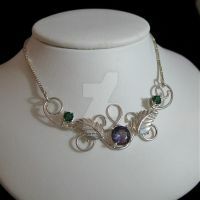 I created the centerpiece using a gorgeous 20mm amethyst glass faceted jewel at the center. Hand antiqued silver filigree, little silver leaves and flourishes are accented by vintage brass leaf motifs. Gunmetal and dark brass chain swags are paired with new and vintage glass beads in purple iris and metallic purples. I adore this piece. I love the rich purples and the faceted beads.